The Matrix Seating System has been utilized worldwide for more than 40 years. The Matrix idea began as Canadian research project 1975-1978. The aim was to create a mass producible universal O&P body support system. 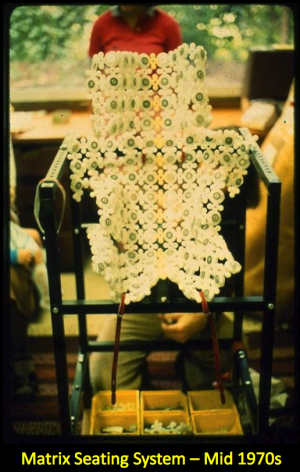 In the 1980s, custom-molded seating R&D continued in Europe where Adjustable Micro-Modular Seating (AMMS) systems (UK – Matrix Generation 1) and vacuum forming support systems (Germany) were being developed. In the 1990s, AMMS orthotic corrections (the door technique) R&D began in Sweden and the UK. Matrix Generation 2 was developed. AMMS continued to improve in the 2000s. In 2014, Matrix Easy Fit Back Support and Matrix Complete Seating evolved as a result of focus groups in the US. In 2017, Matrix Seating USA launched Matrix Custom Back Support (E2617). Differences between Matrix Seating USA products and previous Matrix generations include advancements in the engineering of materials and design, resulting in a dynamic product (with a custom cover) that is easy to form to a client and mount to a wheelchair.